Written recorded, mixed and mastered by Simon Scott at SPS in Cambridge. Strings performed and recorded in Glendale, California by Charlie Campagna (‘cello) and Zachary Paul (viola and violin). Pipe organ recorded at The Unitarian Church, Cambridge, UK. Simon Scott has released a single track EP. The EP, Grace, which came Friday (August 10), was released via Touch on their Bandcamp page. It also features the expertise of Charlie Campagna and Zachary Paul. The Cambridge sound ecologist and multi-instrumentalist has combined electronic ambience with more conventional instrumentation to create soundscapes truly unique, hence the necessity of reviewing this EP. He already has albums Floodlines (Touch), Insomni (Ash International) and Below Sea Level (Kesh/TouchLine) under his belt. “His work explores the creative process of actively listening, the implications of recording the natural world using technology and the manipulation of natural sounds used for musical composition,” explains his website biography. He also plays the drums in Slowdive and has recently collaborated with artists James Blackshaw, ‘Spire’, Taylor Deupree (Between), Isan and many more. 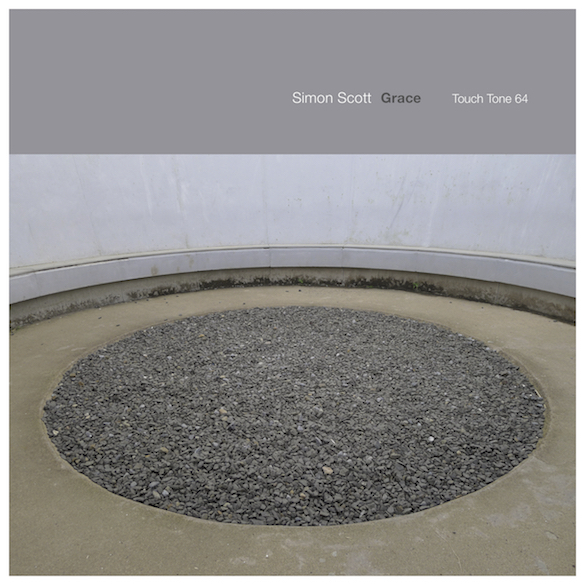 Simon Scott’s forthcoming new album, Soundings, will be out early next year on Touch. Sole track, “Grace”, rings in powerful and cyclical. Like an overhead fan big enough to cut you in two. Strings lend a certain graveness to proceedings. The ringing sensation is almost overpowering, a sonic assault that makes you sit up and take notice, inspiring deep thought and contemplation. Pulsing, futuristic and maybe even dystopic. What seems chugging helicopter blades gives way to grumbles, earthy and organic. Ascending to the air, only to have your feet back in the dirt. A prolonged ringing with grave strings propping it makes itself known. The latter build in majesty but are too proud to embellish their tearful strains. By this time, it honestly gets to the point where it feels like a spiritual experience, evocative of Eastern influences. Glass effects are imbued with the strength of cutting diamond, the shattering sounds strangely cathartic. A rousing change in proceedings, now more alert and grave than ever. A conflict, it seems, has come about and needs resolution. It rings foreboding, an occasional squeak making you feel as if you’re not alone. Not in a particularly benevolent way, neither. The ringing pitch increases, the tension is building and you feel something of utmost importance is about to unfold. A carousel of sound spins, sometimes sounding far and distant and sometimes sounding too close to home. Is that massive, chugging fan closing in to cut? It seems like the drum of a washing machine has been launched into space, its churning of clothes high pitched as it propels into oblivion. It becomes distant as the song fades out. This was a very ambitious release. Some people genuinely try to get away with releasing single and double track length EPs, sometimes barely deviating from the approximate three minute structure. This, however, is bold and could open Scott to far more criticism than, say, splitting this piece into three to six separate parts. It’s because of this that he’s definitely bold putting it out as one. It was definitely worthwhile not splitting the whole narrative into separate parts. Following his gut arguably saved the EP from sounding very disjointed if split in say the conventional way that, daresay, concept pieces are put together. This is almost besides the point to what the music actually achieves. Whether split into one, three or six this EP is a journey into sound, and different listeners will interpret differently depending on the power of their varying imaginations as everyone is unique.